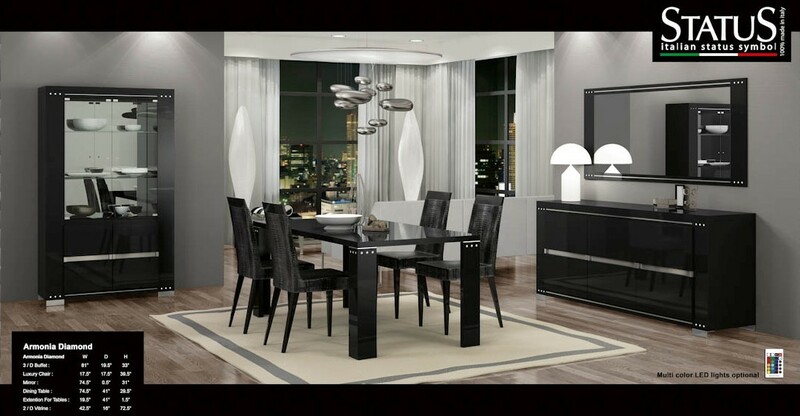 This Italian modern dining room set features rich black lacquered finish accented with perfectly matched diamond imitation and metallic. High back chairs are upholstered in black crocodile leather and offer durability along with large table that comes with extension. Armonia Diamond Italian modern dining room set also has an option for six drawer buffet or four drawer vitrine both featuring LED light kit that offers multiple colors to choose from.